This is a declining regional endemic that is undergoing range contraction and continues to decline through most of its range. It has been extirpated from nearly 70% of its historic range. Through most of its current range (although fairly large), it is rare, shows no signs of recruitment, and faces major threats. It is endemic to the Neosho and Verdigris basins of the Arkansas River system in Kansas, Missouri, Oklahoma and Arkansas. Distribution of relic shell material indicates that the species was once widespread throughout these basins. It was historically reported from the Illinois River in Oklahoma and Arkansas; the Neosho River in Oklahoma and Kansas; Neosho River tributaries, including the Elk River in Missouri, Cottonwood River in Kansas, and the Spring River in Oklahoma, Kansas, and Missouri, and Spring River tributaries, North Fork Spring River and Indian Creek in Missouri, and Shoal and Center Creeks in Kansas and Missouri; the Verdigris River in Oklahoma and Kansas, and its tributaries, Caney River in Oklahoma and Kansas, and Fall River in Kansas. Recent status surveys conducted throughout this area indicate that the species has been extirpated from much of its range. In the Neosho River basin the species now survives in the Neosho River (KS), Elk River (MO), Spring River (MO, KS, possibly OK), North Fork Spring River (MO), Illinois River (OK, AR), and Shoal, Indian and Center creeks (MO). 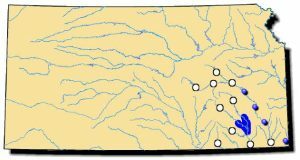 In the Verdigris basin the species survives in the Verdigris River (KS) and Fall River. Comments: The younger shells of the Neosho mucket are bright yellow and often marked with greenish rays and chevrons. As the mussel ages, it turns dark brown but often retains the green rays. The adults become moderately large and are sexually dimorphic in shape. This mussel could be confused with the plain pocketbook or the mucket. However, the Neosho mucket has lower umbos than the plain pocketbook and it does not occur in the same river basin as the mucket. Insufficient numbers of bass in the lower Neosho, Fall and Verdigris rivers may be a factor in the decline of the Neosho mucket. Unfortunately, most of the individuals there appear to be well-worn and old. 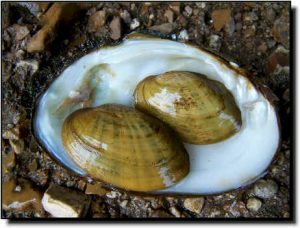 However, the Neosho mucket is one of the predominant mussels in a short stretch of the Spring River. Juvenile Neosho muckets produced by artificial propagation in a fish hatchery have been successfully introduced into the Fall and Verdigris rivers, presenting some hope of replenishing the species throughout its range.